Keeping your living room neat and organized is a challenge we all face. This rustic style side pier makes that task much simpler thanks to spacious and adjustable storage. Behind each of the storage piece's two door compartments are a couple of adjustable or removable shelves that allow the unit to adapt to your unique storage needs. Meeting your storage needs doesn't mean sacrificing on style with this piece though. 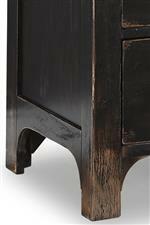 The bookcase combination shows off a unique weathered look thanks to a black finish with subtle rub through to show off the underlying wood. The Homestead Rustic Side Pier with 4 Adjustable Shelves by Flexsteel Wynwood Collection at AHFA in the area. Product availability may vary. Contact us for the most current availability on this product. W1437-069T Side Pier Top 1 31" 20" 42"
W1437-069B Rustic Side Pier Base with 2 Adjustable Shelves 1 31" 20" 31"
Storage Two doors behind which are two adjustable or removable shelves.Wood and glass door panel inserts included.